Bassline: OB-6 (hardware instrument) by Dave Smith Instruments. Short stabs: OB-Xd (virtual instrument) by discoDSP. Noisy synth: Vanguard (virtual instrument) by ReFX. a) Polysix (virtual instrument) by KORG. This virtual instrument is a modern remake and emulation of the original KORG Polysix.. by KORG itself. As a polyphonic virtual analog synthesizer, it has a VCO and sub osc per voice, elaborate modulation and unison effects, giving it its characteristic brassy sound. 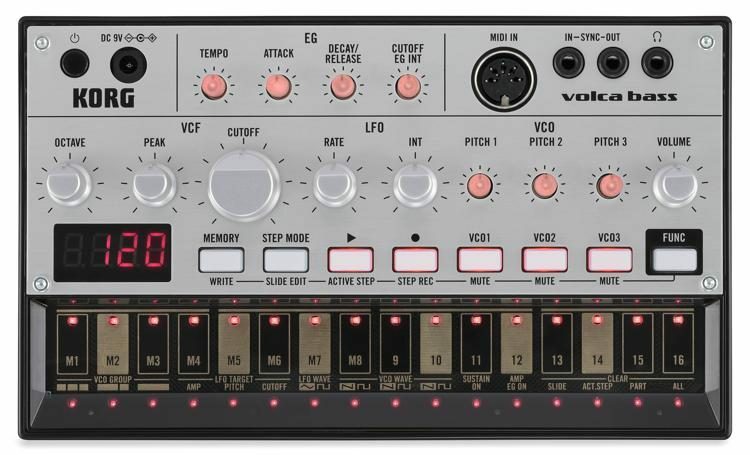 b) Volca Bass (hardware instrument) by KORG. A small little monophonic powerhouse that looks like a toy but packs a punch. It contains 3 tunable saw/square VCOs, along with a distinct VCF that is very closely related to the legendary KORG MS-20. Its signal path is completely analog, with modern MIDI and sync capability. c) TAL-BassLine (virtual instrument) by TAL. 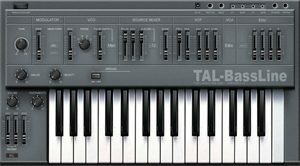 This is a freeware virtual analog bass synthesizer equipped with the usual knobs and sliders as you would expect on physical hardware. It contains mixable saw or pulse VCOs, very fast envelopes and oversampled audio.